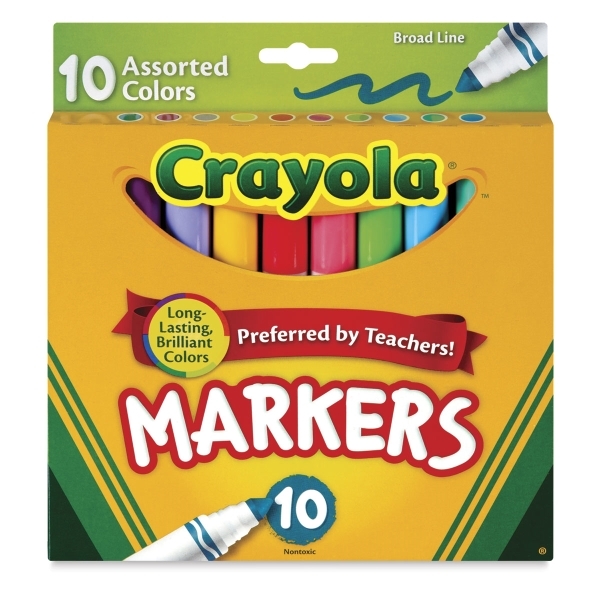 Crayola Classic Colors Markers are the long-lasting, durable markers you remember from your childhood! These markers are designed to stand up to the most demanding school use. The broad tip and thin line markers both lay down lots of brilliant color, yet won't bleed through most paper. All Crayola markers and colors are non-toxic. The ink is waterbased but may not wash out of clothing. Assorted Colors, Set of 10 — Set includes 10 broad tip markers in Blue Lagoon, Battery Charge Blue, Electric Lime, Hot Pink, Infra Red, Laser Lemon, Primrose, Sea Green, Teal, and Tropical Violet. Glitter Markers, Set of 6 — Glitter Markers add shine and sparkle to your artwork. Colors include Silver Sparkle, Emerald Zest, Blue Blazes, Violet Glitz, Fire Flecks, and Gold Medal. Metallic Markers, Set of 8 — Metallic markers add a colorful sheen to your artwork. The set of eight markers includes Purple Steel, Copper Mine, Green Machine, Slick Silver, Gold Ingot, Pink Bling, Black Iron, Cobalt Blue. Assorted Colors, Classpack of 256 — Set contains 16 of each color, including Red, Blue, Green, Brown, Orange, Violet, Black, Yellow, Turquoise, Sandy Tan, Raspberry, Iguana Green, Flamingo Pink, Dolphin Gray, Tiger Orange, and Royal Purple. Packed in a sturdy cardboard box. Broad tip. Assorted Colors, Classpack of 200 — Set contains 20 of each color, including Red, Blue, Green, Brown, Orange, Violet, Black, Yellow, Flamingo Pink, and Dolphin Gray. Packed in a sturdy cardboard box. Fine line. Classic Colors, Set of 12 — Set includes one each of Black, Blue, Brown, Green, Orange, Red, Violet, Yellow, Sandy Tan, Blue Lagoon, Dolphin Gray, and Flamingo Pink. Broad tip. Bold Colors, Set of 8 — Set includes one each of eight bold colors, including Golden Yellow, Azure, Primrose, Teal, Emerald, Plum, Magenta, and Copper. Broad tip. Classic Colors, Set of 8 — Sets include one each of Black, Blue, Brown, Green, Orange, Red, Violet, and Yellow. Available in both broad tip and fine line. Classic Colors, Set of 10 — Sets include one each of Red, Orange, Yellow, Green, Blue, Violet, Brown, Black, Pink, and Gray. Available in both broad tip and fine line.